When in 1930, George L. Peet arrived in Kuala Lumpur as the first correspondent for The Straits Times based in the city, the Federal capital was only a few decades old. Within living memory, it had been a Chinese mining village, but grew prosperous on the back of trade in rubber and tin. Kuala Lumpur's importance grew in stature as the administrative headquarters of the Federated Malay States, and by the first half of the 20th century, its pace had quickened to become the administrative and economic pulse of the entire peninsula. It was in the buzzing, newly-emerging metropolis and against the subsequent gloom cast by the Great Depression that Peet worked tirelessly as the Straits Times' correspondent in Kuala Lumpur to secure for the newspaper a foothold in Malayan social and cultural life that would only slacken by the advent of the digital newsprint. Peet's charming kaleidoscopic accounts of Malayan life in Kuala Lumpur are some of the most authentic ever written and his observations curiously prophetic, as if Peet had the full measure of the country and its people despite having lived in Malaya for less than ten years. Present-day readers will be thrilled by Peet's early description of Kampung Baru - or the Malay Agricultural Settlement (MAS), as it was known when it was first established in 1900 - along with an early allusion to its once-famous Pasar Minggu(started just a fortnight before Peet wrote about it in 1932 and kept going for years afterwards), a Sunday market affair which remained a cultural institution for city Malays for many years though now, alas, largely forgotten. There are also numerous accounts of old Kuala Lumpur generously sprinkled with topographical details, among the most charming of which may be Peet's article describing the relatively isolated old coffee estate on Weld Hill in what is now the incessantly busy area around Jalan Raja Chulan and the Kuala Lumpur Tower. Exploring Kuala Lumpur's Chinatown on foot, Peet had captured not only quaint forgotten rites of the Chinese community in the capital, but also the sights and sounds of this crowded section of the city. Also included here are Peet's peerless accounts of Malay life in Selangor in the first half of the 20th century, including rare snapshots of long-forgotten towns such as Bandar and Jugra, along with an engrossing account of the Malay witch-doctor or the Pawang, an indispensable fixture in rural Malay society for many years even after Independence. Peet's observations of the effects of the 1930s slump on the Malays of Kuala Lumpur make fascinating reading, based on conditions he personally witnessed in predominantly Malay areas such as Setapak and Ulu Gombak. Peet's analyses of the socioeconomic conditions of the Malays were uncannily accurate and curiously prophetic, though written decades before the Government embarked on its affirmative action policies for the Malays in the 1970s. Peet travelled throughout the peninsula gathering material for his newspaper columns. Readers will find particularly enchanting Peet's recollection of driving across the whole breadth of Pahang in the 1930s on lonely jungle stretches with not a single living soul within miles; or his attempt to retrace on foot the history of the once-thriving port of Lukut - one of the best-governed towns in the entire country on the eve of British intervention in the 1870s - in the company of the late Tan Sri Abdul Mubin Sheppard; or his rare and haunting account of a weekend excursion to isolated Bukit Kutu, now a favourite spot for intrepid hikers on the summit of which nothing is left to corroborate Peet's description save a ruined chimney stack - all that remained of the forgotten hill retreat which was completely decimated by Japanese aerial bombing during the Second World War. Elsewhere there are delectable accounts of every known corner of Malaya, and contemplative descriptions of the inevitable encounter between the ancient Malay kingdoms of the East Coast and the bold forces of modernity. In fact, this encounter between tradition and modernity is one of the recurrent themes that runs like a thread throughout Peet's engaging collection. All articles presented in this volume first appeared in Peet's eponymous Saturday column which he maintained throughout his 4-year stint in Kuala Lumpur as the Straits Times correspondent. Originally published in 1983, Peet's Journal in the Federal Capital was very well-received when it first appeared but sadly has long been out of print. Peet, in spite of his advanced age, took great pains in the selection of articles and photographs in the original edition. Some minor changes have been made in the present volume with the inclusion of photographs not otherwise present in the original issue but the text has remained unaltered, a testament to the enduring quality of Peet's highly original voice. As much as the book would interest the casual reader and historian of modern Malaya, urban and socioeconomic policy planners would find ample material here for reflective thought. This, then, is a volume to cherish and the Society is pleased to make Peet's charming anthology once again available to the public. "He revelled in the job and this book presents some of his reports at the time, just as they appeared, and they make fascinating reading." Reprint No. 34 - A Journal in the Federal Capital has been made possible through the generous support of Think City, an urban regeneration vehicle which is currently spearheading efforts to revitalize the historical core of Kuala Lumpur and surrounding areas. George Lamb Peet was born in 1902 in Secunderabad, India, the son and grandson of Methodist ministers. Peet arrived in Malaya from Colchester, Essex in 1923, aged about 21 to join the staff of The Straits Times in Singapore as junior reporter. After The Straits Times opened its branch office in Kuala Lumpur, he was assigned as its first resident correspondent there. 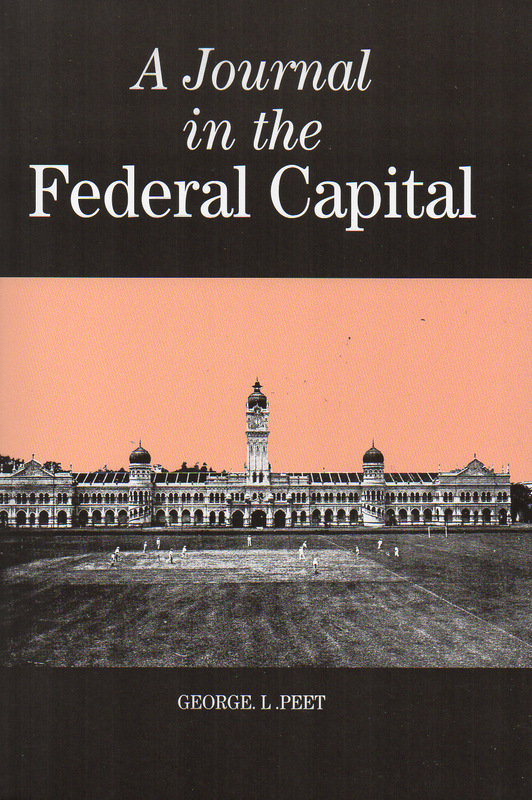 During his four-year sojourn in Kuala Lumpur (1930-34), Peet penned a number of broadly appealing articles on Malayan subjects which he - towards the end of his life - compiled for the MBRAS into the present volume, A Journal in the Federal Capital. Peet very quickly established himself as one of The Straits Times' leading journalists, and in this way rose steadily through the ranks to become its assistant editor from 1934-39 before finally assuming the editorship in 1946-52. Upon retirement from The Straits Times in 1952, Peet settled in Perth where he continued to work for a West Australian newspaper until his final retirement in 1967. Apart from the present volume, Peet also wrote Rickshaw Reporter, his memoirs of pre-war Singapore; Within Changi's Walls, an account of his internment in Singapore's notorious Changi and Sime Road Prisoner of War camps during the Occupation years and Malayan Exile, a slim memoir of his days as The Straits Times' correspondent in Kuala Lumpur. Peet's papers, currently kept at Murdoch University, represents a valuable resource on Malayan history. Peet, a former Council member of the MBRAS, was also a staunch Rotarian. Peet died in Perth on 18 August 1985, following a lung infection, aged 83.